Activity in the Atlanta industrial real estate market has remained fairly high and stable since 2009. The fourth quarter of 2012 showed activity at 10.2 million square feet, ending the year with a total of 45.8 million square feet of activity. This high level of activity in the last quarter is pretty surprising because, as Sim Doughtie states in our most recent Point of View, “typically industrial activity decreases 20 to 30 percent during a quarter when national elections are held.” The reason the Atlanta industrial market did not seem to follow the trend this time is probably because many industrial building owners decided to sell property before the end of the year to avoid an increased capital gains rate in 2013. 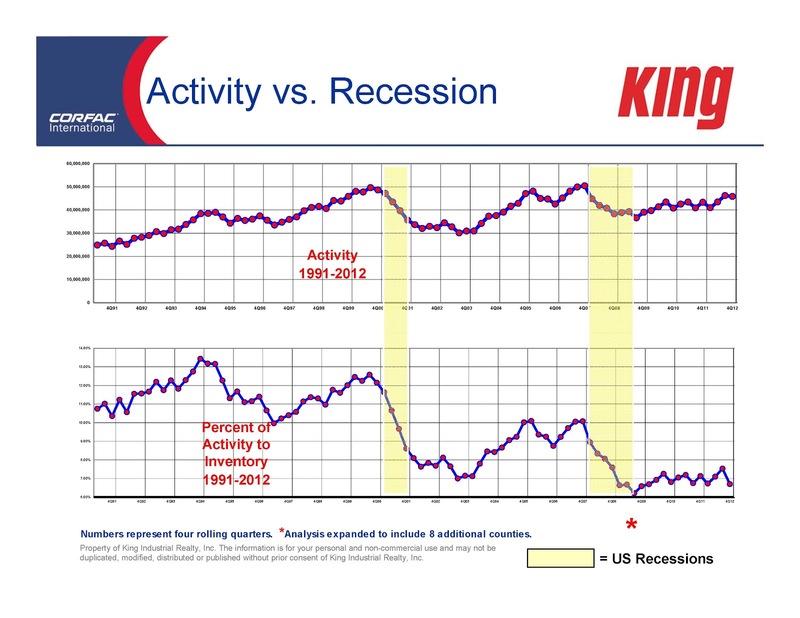 Although the high level of industrial activity over the last few years sounds great and seems like it means good things, when compared with inventory levels for the same time period, we have to realize that the market probably isn’t improving for us as much as we hoped. The top graph in the slide shown below shows the square footage of deals signed each year. These figures have stayed fairly high even throughout economic downturns. The bottom graph shows these same figures for square footage, but compared to the entire Atlanta industrial real estate market. Activity, when compared to inventory, has been very low for the last several years.